For a dinner on my birthday, Linda prepared grilled strip steaks, mashed golden potatoes, green beans and corn, followed by chocolate silk pie with fresh berries. Bill and Beth C joined us, back visiting from SC wrapping up real estate. 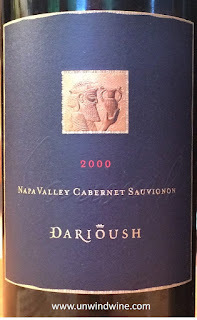 I pulled from the cellar Darioush Napa Valley Cabernet which was the wine we had at our first wine event together years ago. 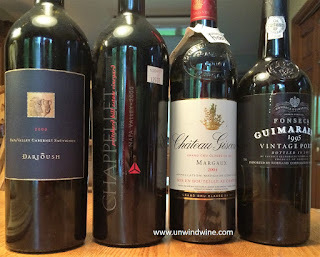 I selected a 2000 vintage bottle from the near dozen vintages available, as the one most ready to consume. For a mini horizontal tasting, to pair with it for a comparison, I pulled another 2000 vintage Napa Cab, Chappellet Pritchard Hill. Bill brought a Giscours Bordeaux. For my birthday dinner, I pulled from the cellar one of nearly a dozen vintages we hold of this top flight Napa Cab. We've enjoyed Darioush Cabernet at several visits to their magnificent winery Chateau on the Silverado Trail in Napa, and at special events including a special Darioush Wine Dinner at Everest in Chicago. We had a special barrel tasting at the winery back during our 2003 Napa Wine Experience. My last tasting notes for this wine were back in 2010, when I wrote "dark color - big forward firm intense dark fruit - black cherry, dark berry, tobacco, cigar box and touch of leather. Not for the feint of heart - needs big bold food." 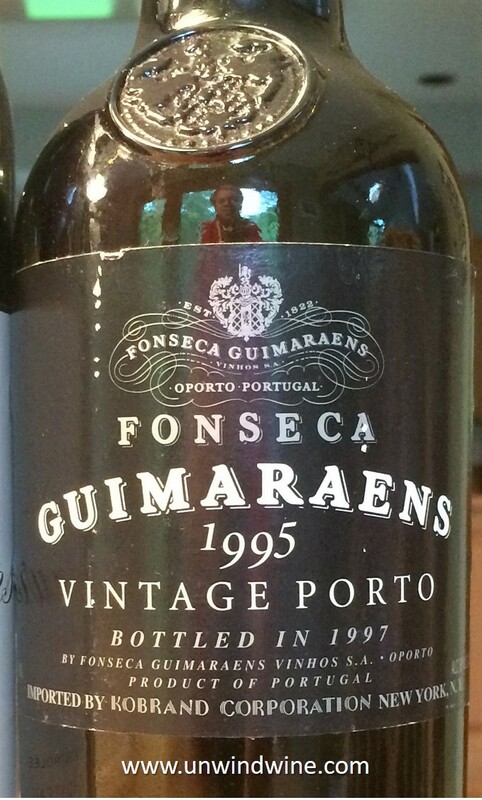 This showed bright vibrant dark sweet berry fruits, was smooth polished and well balanced with layers of accent tones of mocha, tea and tobacco leaf, with a firm backbone of silky tannins on the finish. We tasted this wine with Bill and Beth at the winery during our Napa Valley Wine Experience in 2009. At seventeen years, this is not showing any signs of diminution. This was more subdued than the Darioush, almost closed and tight in comparison. Dark garnet colored, medium full bodied, dark blackberry and black cherry fruit with tones of graphite, black tea, earthy leather, and tobacco. 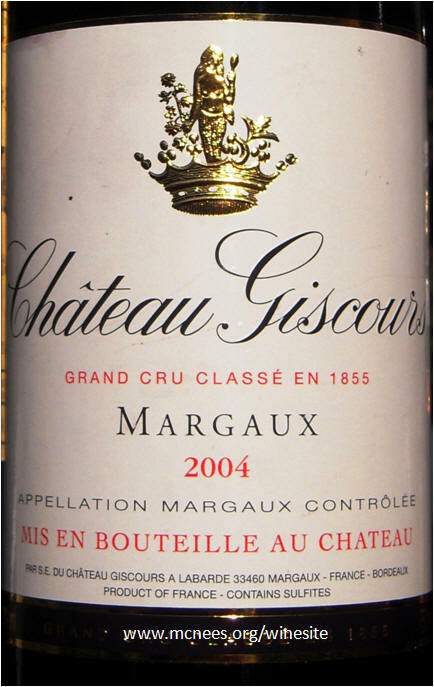 Giscours is one of the typically reliable higher QPR (qiality price ratio) value Margaux Bordeaux which were the highlight of this years 2014 release tasting. I wonder if this bottle was perhaps tainted a bit. Garnet colored, medium bodied, there was a bit of earthiness barnyard funkiness permeating the black cherry, tea, graphite and leather, hint of spice and cassis, giving way to lingering acidity and tannins. 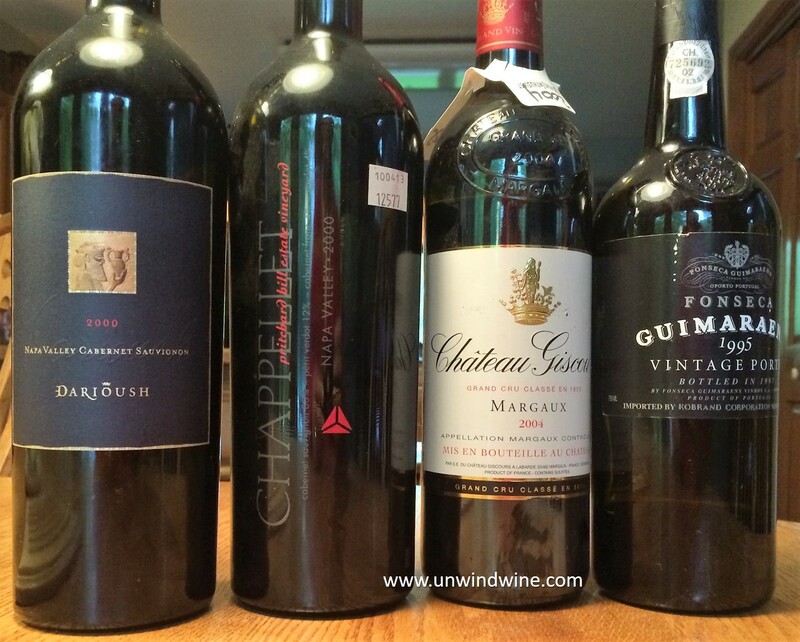 A blend of Cabernet Sauvignon (60%), Merlot (32%), Cabernet Franc (5%) and Petit Verdot (3%). "Incrementally even better than before. I've had a bunch of bottles of this since 2008 and it has stayed remarkably consistent. Dark, dark fruit on the nose with leather, integrated alcohol. Palate is balanced with tobacco, modest spice component, leather, and big fruit undercurrent yet still has an astringency that keeps it organized."